What is the Matrix Energetics Process? The Matrix Energetics system is a transferable and teachable phenomenon, powered by intent, which has a physical and observable effect every time. It was created by Dr. Richard Barlett. Complete beginners as well as seasoned health care practitioners are able to perform and utilize this work to affect dynamic change. It starts with a gentle light touch and the power of focused intent and builds into a new and joy-filled state that can affect life changes. 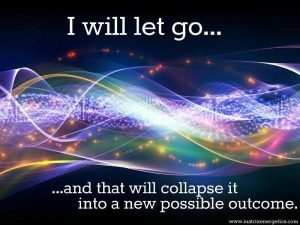 This exciting new tool can be used to heal, to transform and to create new possibilities. It’s very much about transforming your beliefs concerning healing, disease and the structure of reality. Often you will see and feel a wave-like motion when the Matrix Energetics approach is applied, as the person being worked on experiences a smooth wave of transformation and the body seems to drop in a completely relaxed wave instantly. This can happen standing up, sitting down or laying on a table. The participants are taught specific methods of using a powerful, focused intent, This is combined with application of a light touch method for identifying the parts of the body where the Matrix Energetics “wave” will yield optimum results. What seems to be happening is that the unconsciousness and the biological physical fields are interacting. The Matrix Energetics process is not a “thing” to be defined. It is, instead, a pathway to transformation. This transformation takes place by communicating at the quantum level with the wave fronts (energy and information) that create all of reality. The tools taught in the seminar are simply a language used to access this pathway and map the transformation that occurs. The application of this method of transformation is only limited by your imagination. What are you doing when you “do” the Matrix Energetics process? You are creating and transforming reality at the quantum level and observing the macro effects of that change. This new paradigm gives you instant access to new states of awareness which make it possible to interact with the material world and transform it – to affect change connected to past traumas, injuries and emotional patterns. The Matrix Energetics approach shows us how we can consciously choose to observe in a different way. As a natural extension of changing your way of perceiving, your old reality collapses and new possibilities materialize instantly. Physical and emotional conditions can be resolved with the speed of thought. People affect verifiable, observable changes instantly. Utilizing the Matrix Energetics system enables one to engage a state, or way of being, that creates miraculous changes that can be actualized every time by novices and experts alike. It frees us from the non-miraculous, static belief systems that have dominated our daily lives. There are no barriers to the expression of this energy and there are no limitations for it. The limitations are in your own mind and with practice you transcend those limitations. It is like learning a new language or acquiring a new skill in a sport, where first you have to think about all the rules, and then at some point, you begin to think in the language itself or act fluidly with skill. According to modern physicists, all reality can be described as vibrations and waveform patterns, that everything is light and information. It’s more than a technique! Although there is a specific set of methods, the Matrix Energetics approach itself is not a technique but a consciousness shift. It’s using an energy field and a consciousness, like a standing wave. And it’s always there. People in the seminar who’ve never done any so-called healing work in their lives, never done any kind of energy work, will suddenly access the matrix wave and fall to the floor. Because once you “get it”–the knack of the way you observe your reality, attach a new paradigm, and then attach a new consciousness to that paradigm–then you get instantaneous changes in physical matter. There is nothing physical. Instant change is possible! The Matrix Energetics system teaches from the premise that we are spirit living in a physical body, that we can access a reality that is no longer limiting, and that instantaneous change at the speed of light is possible. This system introduces time travel and other techniques. These techniques enable us to access the lattice of information in new ways to affect change. The process of conceptualizing an energetic interaction as needing manipulation of a muscle or bone, repeated therapy or the running of energy, etc., limits transformation’s speed, intensity, potential and depth of expression. Seeing change as something which entails a mechanical process slows down the observer’s reality. Something that potentially can be instantaneous slows to a process that conforms to your previous therapeutic expectations. The Matrix Energetics process creates a state by which transformation can materialize. The more you trust, the greater your wave, the greater your experience of transformation. The description of energy and matter as composed of waves allows you to enter into a non-consensus reality in which your imagined outcome can encode and imprint on consciousness in such a way that physical observable changes become the result you imagined. You’re creating an altered state, a different reality, which you energize and give life to with your active imagination. And through the power of focused intent, it can all happen now. You are learning to co-create. You’re creating an altered state, a different reality, which you energize and give life via your active imagination. So the secret is that your imagination, your creative imagination, is the force. All energetic medicine, all healing, all consciousness-based techniques will work, but can you reproduce them every time? Can you get to the point where you know you had an effect? With the Matrix Energetics approach you can measure the effects, the person you worked with can measure the effect, and you can both agree that there was an outcome. The Matrix Energetics system allows you to access a source of immense power limited only by your imagination, that you can use to work on yourself, help your children or loved ones, or help all sentient life. It works equally with anything. And the energy field is always there.